The email goes out every weekday from the Mayor's Unified Homeless Response Center to a long list of recipients in L.A.: Details of all planned cleanup operations. On any given day, plans can call for operations at up to 40 homeless encampment locations in the city, an analysis of six months of daily emails by KPCC/LAist found. What goes on at those so-called "sweeps" has become controversial. Last week, a small crowd gathered under a cloudy sky near a homeless encampment beneath the 101 freeway on Alvarado Street in Echo Park. 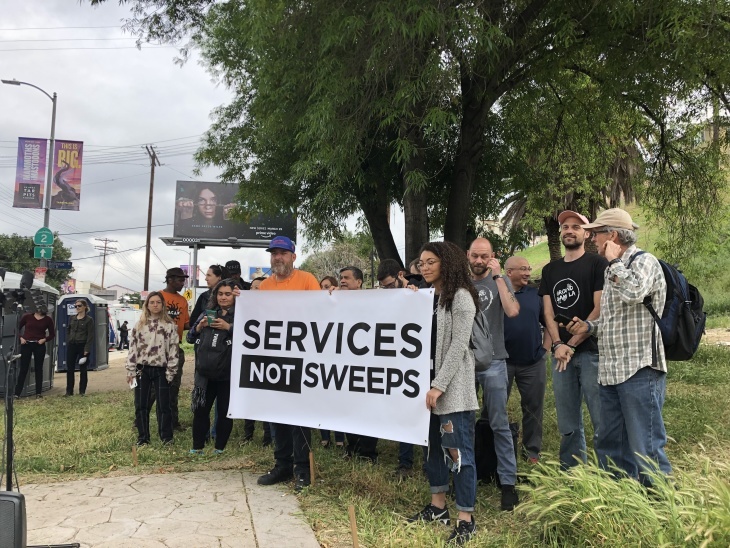 The two dozen or so protesters were there to launch a new "Services Not Sweeps" campaign, and demand the City of Los Angeles change how it's addressing the myriad of public health and sanitation problems caused by its crisis of unsheltered people. The broad coalition of neighborhood homeless advocates, service organizations, and housing developers say the status-quo of sanitation encampment sweeps backed by police enforcement is ineffective, expensive, and ultimately makes it harder for people living on the street to end their homelessness. "Sweeps" in L.A. and elsewhere typically involve multi-agency cooperation, with sanitation workers, homeless outreach workers, and law enforcement all coming together. Such sweeps have become both increasingly frequent and well-organized in Los Angeles over the past three years. "The city has no interest confiscating people's belongings, or moving people along. The city has no interest in doing that. What we want to do is make sure people can come indoors, and that there aren't encampments to address on the streets, so we can make sure the streets clean and the sidewalks are passable." But the encampments are still there, and they will be for years to come. Meanwhile, people are moved along and belongings are being confiscated daily. In the city's most recent approved budget, joint departmental programs conducting encampment sweeps/cleanups received at least $30 million in funding. The year before that, according to the L.A. Times, funding was $13 million. 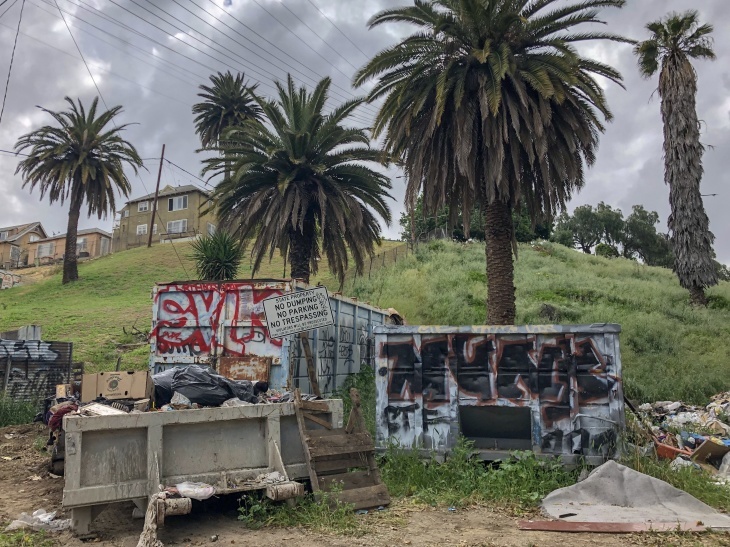 City officials point to surging complaints from housed residents and businesses about sanitation and safety issues related to the encampments to explain the increased cleanups. Authorities also justify the uptick by pointing to the outbreak of Hepatitis A that killed 20 on the streets in San Diego in late 2017. Those sweeps, with program names like Clean Streets L.A. and L.A.P.D. 's "HOPE Rapid Response," are coordinated by the Office of Los Angeles Mayor, Eric Garcetti. Homeless advocates argue the current approach is counterproductive. "People lose paperwork and documentation they need. [Sweeps] impact people's immediate lives, but they also mess up the system we're trying to create," said Becky Dennison, the executive director of Venice Community Housing. Dennison, whose organization develops housing and provides services for people who are currently or were once homeless, said: "We definitely had sweeps that have stopped people from moving into housing." The Services Not Sweeps coalition is made up neighborhood homeless relief groups like KTown for All and SELAH, community advocates like the L.A. C.A.N., Black Lives Matter L.A., and Chinatown Community for Equitable Development, service provider Homeless Health Care Los Angeles, and others like the Los Angeles Democratic Socialists of America. They make the case that the $30 million spent by the city on these cleanup is a misallocation of limited public resources. Instead of spending those millions on throwing away possessions stored in the public right-of-way and ticketing the people who live there, they ask why the city doesn't provide regular sanitation services. In other words, why not operate more like the predictable and scheduled rubbish pickup that serve Los Angeles residents with permanent roofs over their heads? "If you're going to be cleaning the streets, do it in an organized manner," said Stephany Campos of Homeless Health Care Los Angeles. "Don't have these random sweeps where notices with a specific time and date are put up, but they're not followed through, or other times where there is no notice, and people's medications, belongings, documentation are thrown out." The nonprofit she works for provides medical care for the unsheltered and operates the Re-Fresh Spot laundry and hygiene center in Skid Row, the types of services, she says, people without a home need more of. The current sweeps, Campos says, "really disrupts their lives, and all the work that agencies like Homeless Health Care and other providers are doing to get people ready for housing." When advocates for people experiencing homelessness talk about street-oriented services they mean things like portable bathrooms, mobile showers, laundry trucks, and other methods L.A. could use to address pressing hygiene needs. And some of those services do already exist, including at the site where organizers announced their new coalition last week. "That's why we picked this site because there are already some of the things that we want and need," said Dennison, gesturing at a pair of portable toilets adjacent the Alvarado encampment. "But then you still look around and see piles of trash. Like, come on. If you have a sanitation team working specifically to clean encampments, take away the trash." Those bathrooms have been there since March of 2018, part of pilot program dubbed "Pit Stop." It's one of nine locations chosen for the pilot which launched after San Diego's Hepatitis A outbreak. At the Alvarado encampment, the bathrooms are open to the public from 7 a.m. to 7 p.m. Now entering its second year, Los Angeles plans to expand its Pit Stop program to 16 total locations around the city at a total annual cost of about $6.5 million. Those costs include at least one on-site attendant at all times, at all locations, to ensure facility cleanliness and safety. "None of these things are difficult. None of them are expensive," said Dennison. Access to restrooms has been a chronic issue for L.A.'s homeless population. A city report report from December 2017 identified 55 encampment locations in Los Angeles where no publicly accessible restrooms were within a quarter-mile. Another issue is the presence of law enforcement officers on these sweeps and their power to ticket those living in the encampments, based on existing city law. The coalition is asking to officials to remove police from all of the city's street cleaning teams. 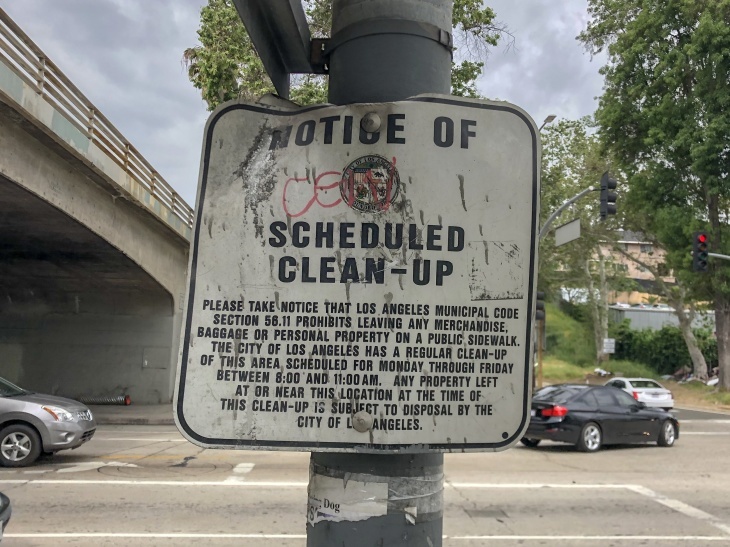 They are also asking the City Council to repeal two city laws routinely enforced during sweeps: Los Angeles Municipal Code (L.A.M.C) 41.18(d), which outlaws sitting on the sidewalk, and L.A.M.C. 56.11, which sets limits how much property homeless people are allowed to have, and outlines a myriad of circumstances where the city is allowed to impound it without prior notice. L.A.M.C. 56.11 is enforced by the Los Angeles Police Department's HOPE teams, one of the two main encampment cleanup programs coordinated through the Unified Homeless Response Center. Also called "Rapid Response," LAPD HOPE conducts "right-of-way" enforcement to break-up sidewalk encampments. Outreach workers accompany uniformed officers and sanitation teams on HOPE team responses, but the department's own numbers show underwhelming results. Though HOPE officers logged more than 13,000 contacts with unsheltered Angelenos in 2018, just 324 of those people received case manager assessments, according to LAPD's quarterly reports on homelessness. Only 10 people were placed into housing. Advocates and homeless people themselves say police enforcement creates additional barriers getting off the street. Low-grade "quality of life" citations are routinely issued to people experiencing homelessness for things like possessing a shopping cart. "These [shopping cart] tickets are close to $400," said Nafeesa Ansar, a 40-year old woman who has been homeless in Los Angeles for two years. "I went to court with my girlfriend, and she had three of them. It was $1,200 she had to pay for shopping cart tickets. The judge looked at them and laughed because one of them said 'with a Toys-R-Us shopping cart.' She looked at clerk and she was just laughing because she couldn't believe this was wasting her time." Tensions over encampment sweeps, police enforcement, and allegations of constitutional rights violations are nothing new. Since the 1980s, sweeps have been scrutinized in an endless cycle of litigation. Newspaper stories written more than 30 years ago read much like ones written last month. "We've sued the City of Los Angeles time and time again. And we've won, time and time again. But there's this culture of 'we'll do what we want to do, you'll sue us,' there will be an injunction, 'we'll do what we want to do, you'll sue us,'" said Pete White, who directs the anti-poverty advocates Los Angeles Community Action Network (LA CAN). "But houseless are still houseless. Houseless people in Los Angeles don't live in lawsuits." At the same time, sprawling encampments on public sidewalks and other spaces are serious health risks, both for the wider public and for the people who live in them. They can be dangerous places that, besides stressing residents and businesses who live and work nearby, force those residing in them to live in constant fear of getting robbed, attacked, or victimized in some other way. White's organization most recently was party to the suit Mitchell V. Los Angeles, when four homeless residents of Skid Row sued Los Angeles for seizing and destroying their property from the street in Skid Row. They claimed the city violated their 4th and 14th constitutional rights. In March, the Los Angeles City Council voted 10-2 to settle the lawsuit on terms not yet defined or made public. "Council instructed the City Attorney to agree to the terms of the settlement that was presented in closed session. The terms have not necessarily come back to council yet, so the City Attorney is still doing what he needs to do on his side, and that's pretty much all we can say about that." Coalition leaders did not say if their list of demands was related to the pending Mitchell settlement. 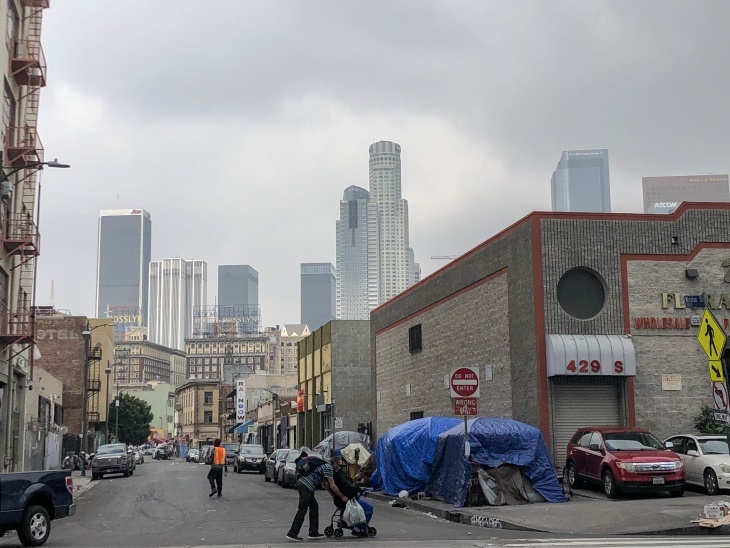 In the days before the City Council decided to settle Mitchell, advocates in the public comment portions of public meetings asked the council for a citywide settlement to the case, extending beyond just Skid Row. In any case, another federal court decision means Los Angeles soon may be forced to change its policies. In early April, the landmark case Martin V. Boise was made final by the 9th Circuit Court of Appeals. That case revolved around the claims of six people homeless in Boise, Idaho, who argued the city's anti-camping rules violated the U.S. Constitution 8th Amendment. "As long as there is no option of sleeping indoors, the government cannot criminalize indigent, homeless people for sleeping outdoors, on public property, on the false premise they had a choice in the matter," said the majority opinion in that case. "A municipality cannot criminalize such behavior consistently with the Eighth Amendment when no sleeping space is practically available in any shelter." Since the ruling last September, San Francisco, Sacramento and Portland, Oregon have stopped enforcing certain rules affecting people experiencing homelessness in public space. And the case is already affecting policy in Orange County. U.S. District Judge David Carter cited it in his 2018 rulings compelling cities in north Orange County to shelter their homeless residents before enforcing anti-camping ordinances. Another lawsuit was filed against south Orange County cities in February. Asked about Martin, officials said they are evaluating the decision with the City Attorney's office. They re-emphasized how there are no quick solutions to homelessness, and their efforts to move people off the street are, above all, constrained by an extremely limited housing supply. In a sense, that message isn't far off from what the Services Not Sweeps coalition say. Pete White of L.A. C.A.N. agrees that more housing needs to be built. "Let's keep building, and do what we need ever we need to do to keep people inside of housing so we don't increase the homeless ranks," said White. "But let's also make sure we provide public health infrastructure for those who are forced to live on the streets." "We are years away from solving our homelessness crisis meaning folks are going to be forced to live on our streets and sidewalks, We simply must do better."